Employee Favorite: Greens 2, a sweet twist on the classic green juice! FAQ: "I just finished a beach run. What should I drink?" After exercise, you want to replenish lost electrolytes, hydrate, and soothe your workout-worn body. Citrus 4's blend of cucumber, pineapple, lemon, and coconut H2O is the ideal post-gym juice of PJ staff - and TCM editors! 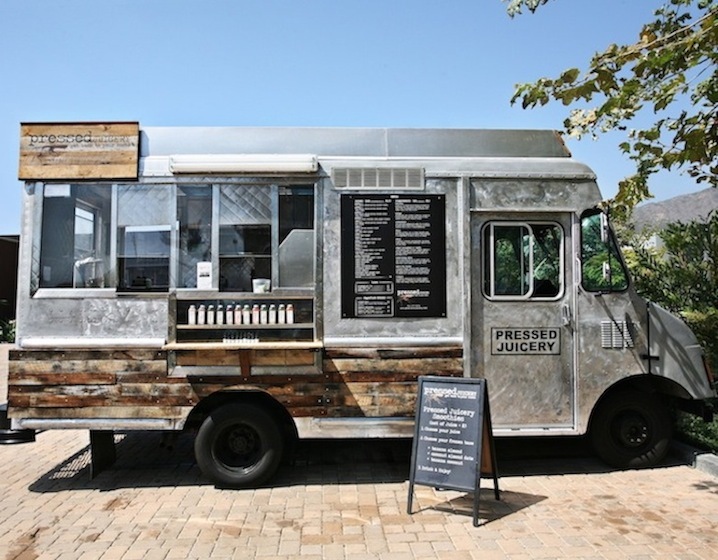 Fun Fact: Brentwood was Pressed Juicery's first location, and is literally a "juice box": a former closet refurbished with reclaimed wood and a split-hinge door. The word is spreading from San Francisco to Studio City that there is a new kid on the block. Pressed is officially booming, and expanding to your favorite neighborhoods across the coast. From the sleek, gorgeous storefronts to the gregarious employees, from the rainbow-juiced refrigerators to the chalkboard accents, your nearest Pressed Juicery outpost might very well become your own personal “Cheers” (everybody knows your name!) Walking into a Pressed Juicery is about so much more than simply picking up a bottle of green juice: it is about supportive community, shared wisdom, vibrant living, and the smallest changes that make the biggest differences. In other words, walking into a Pressed Juicery feels like home. We’ve compiled a set of fun facts and FAQs to catch a glipse of each Pressed Juicery store, from the original Brentwood “juice box” to the newest Bay Area beauty. Take a peek and tell us – which is your favorite? Share the post "Take A Look Inside Each Pressed Juicery Location"
Can you expand to the east? Specifically Atlanta? We need you! Come to Asheville NC! I would love a Pressed franchise! Do you have franchises available? Please, oh please come to Las Vegas!!! Hi Andrea! Pressed is still growing, so keep your eyes peeled! Any thoughts about coming to the south? Alabama!